Have a nice long Easter weekend with the kids coming up? Looking for an idea or two to help keep them busy? I thought I'd gather a bunch of my Easter/spring craft ideas for Barbie in one place. 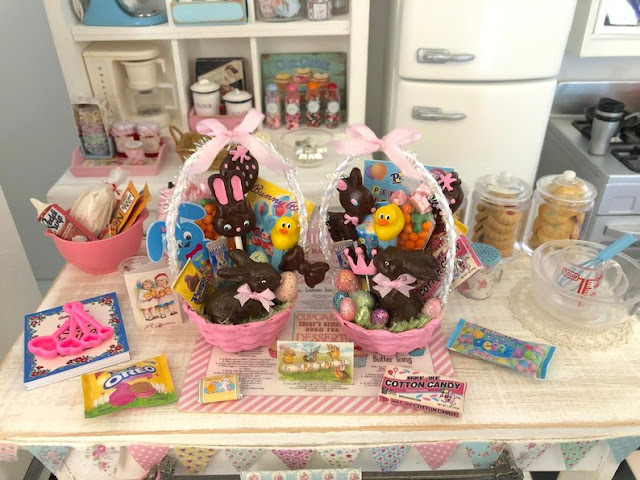 I hope you'll find some inspiration to make a little project or two, and if you're having an egg hunt with a bunch of kids, most of these ideas would be inexpensive group crafts. Click the title to be taken to my original post. I know what you're thinking... Will a wand that small really make bubbles??? Ha, ha-why yes, yes it will! Simply push beads onto pipe cleaner. One larger novelty bead on top is extra fun. Just try to make the circle of beads around an inch or so, to keep it in scale with the doll. Shape the beads into a small circle and twist both ends of pipe cleaner together to form the handle/stick of bubble wand. Keep the handle long enough to bend around her hand. Adjust the circle so it's centered on top of the straight handle of the pipe cleaner. Tie thin ribbon around base, below circle, so it flows in the breeze if desired. 🐰Make something just for fun and have a Happy Easter Weekend! 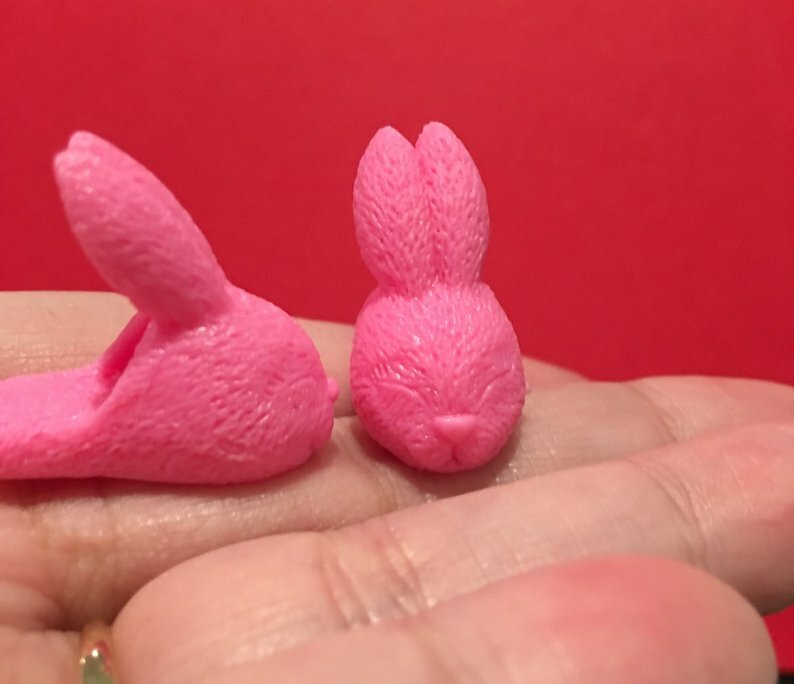 With Easter a little over a week away I decided to pour a cuppa and see what the good folks at Etsy had to offer for Barbie. 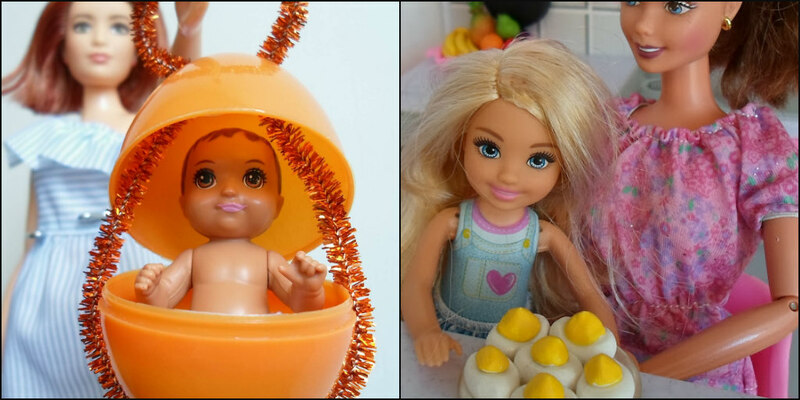 In addition to a lot of originally marketed and packaged Easter themed dolls (and one "scented" Ken??? 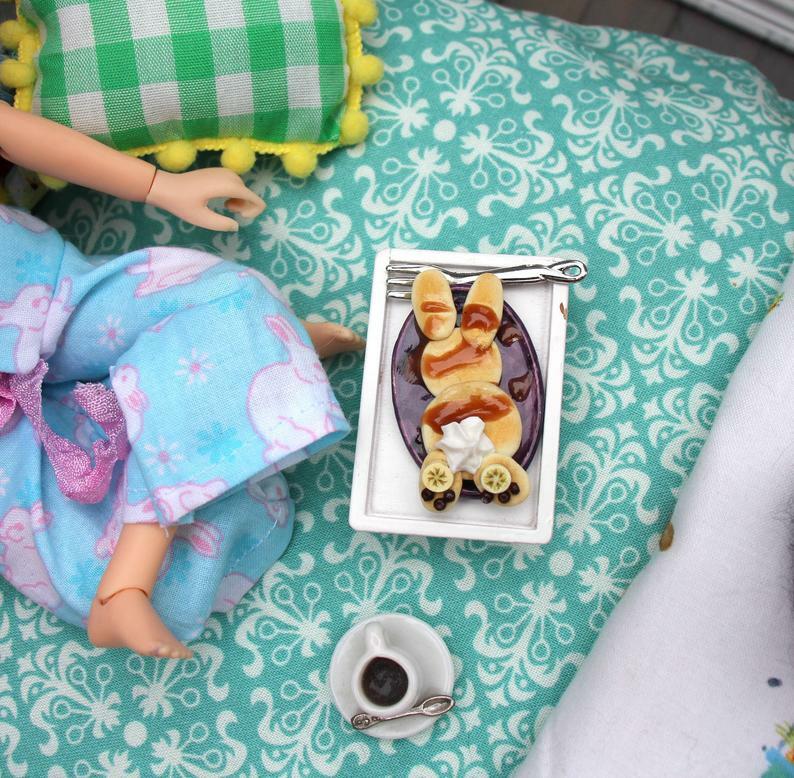 ), there are so many fun things... First up, this adorable bunny pancake plate for Easter breakfast-Love it!!! 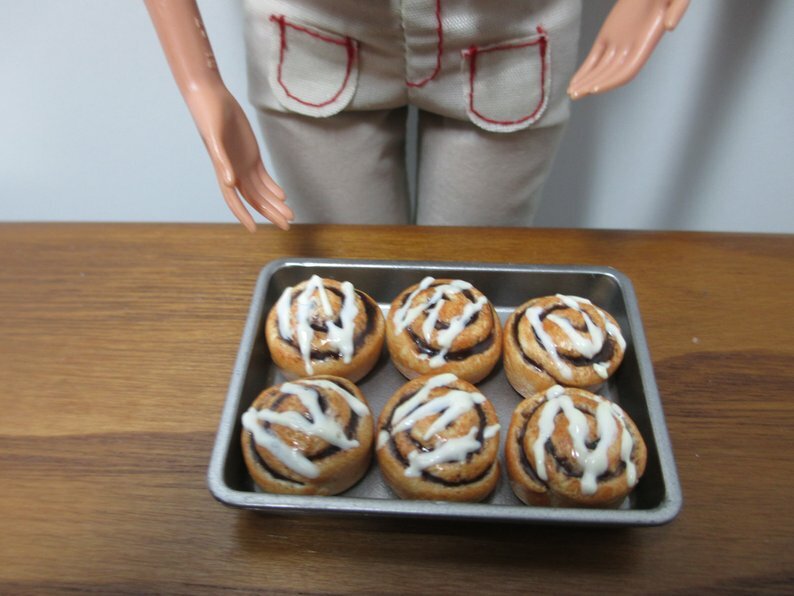 A yummy pan of cinnamon buns. 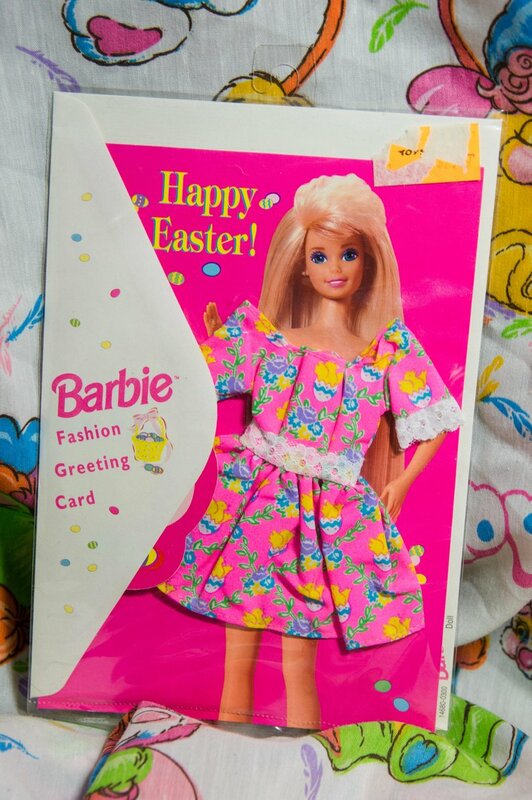 How about sending an Easter card that has an Easter dress attached! Unfortunately, I do have to get ready for work, boo. 🌷Have fun Easter shopping, I wish you all a happy day! 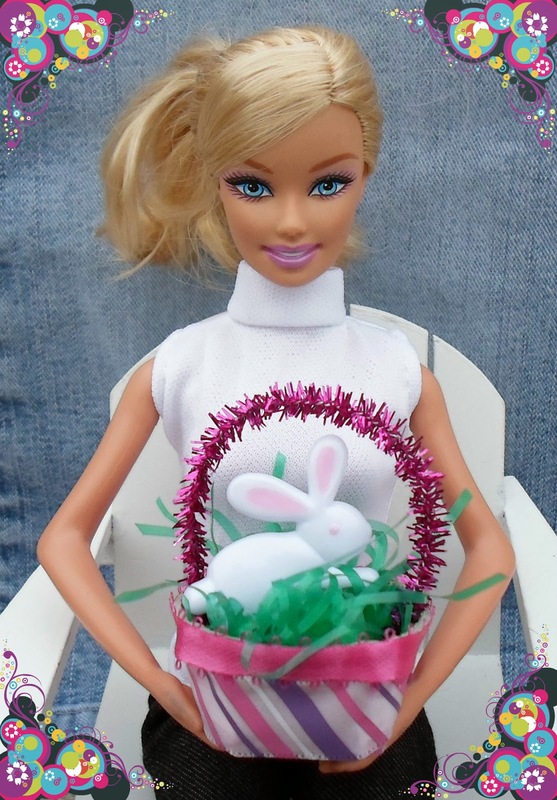 Here's another fun Easter basket for Barbie idea that's just a little more involved than the egg carton one I previously posted. 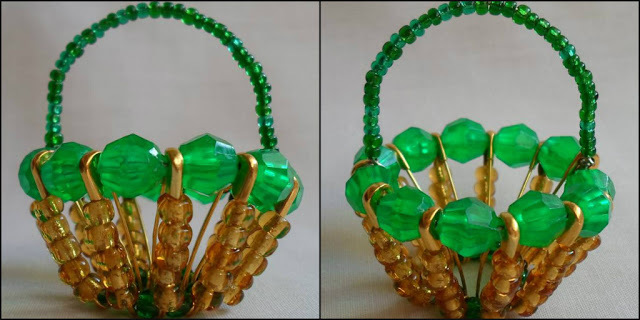 Safety pin baskets are a craft that has been around, probably, ever since there were safety pins! 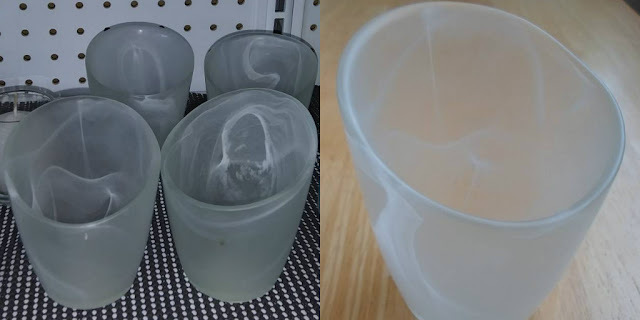 I found a great picture tutorial HERE and really can't add much to the instructions so I'll just provide a link to that site. 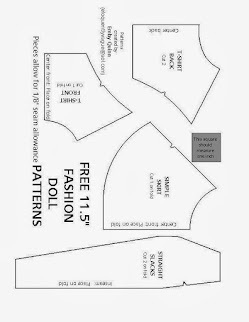 As long as they are old enough to carefully work with safety pins I think girls would enjoy making this project. Once you have all of the supplies gathered (and you understand the instructions), I'd plan on this project keeping the kids occupied for about an hour. The most important thing is the size of the beads. They need to cover the open pointy side of the safety pin ~and~ you need to be able to close the safety pin. Shorter safety pins use up to 8mm beads, longer ones can use wider beads. 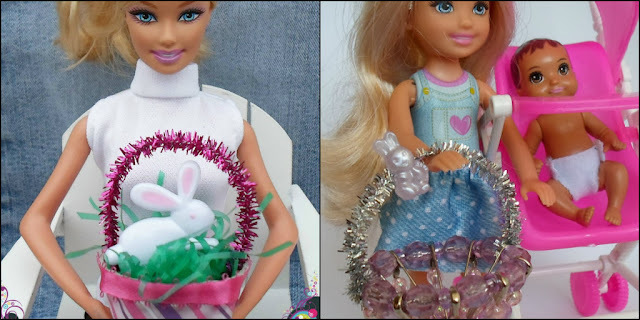 I used 10, 1" long safety pins and think that makes a well proportioned Barbie size basket, especially for playing with the kid dolls. Longer safety pins would make a deeper basket. If you want a wider basket, use 12 or 14 safety pins. The tutorial uses craft wire, I used my never ending supply of pipe cleaners. The tutorial makes the handle out of beads too, I love my sparkly/blingy tinsel pipe cleaner handle. Embellish the baskets any way you'd like, sequins, ribbon, add a little Easter grass, etc. A few years ago I made Barbie one for St. Patrick's Day HERE. 🐰Make something just for fun and have a happy day! Inexpensive, quick, colorful and fun! 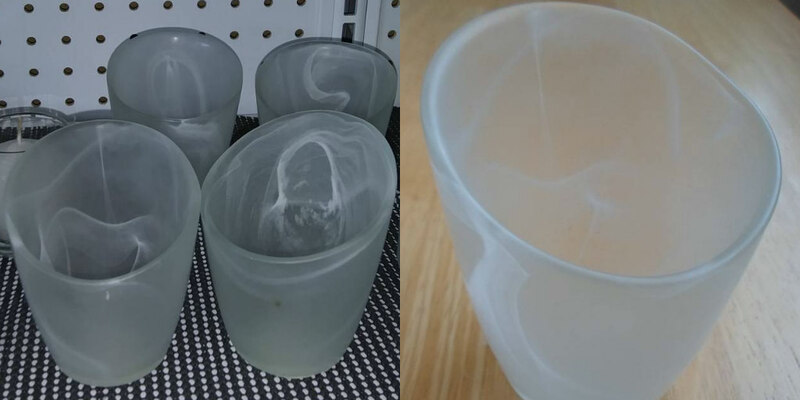 I took a quick pic of the candle holders at the thrift store, and the one I brought home. My Love Seat from an old Eyeglass Case HERE is another cute furniture idea using pom-poms. Philly Barbie says "yo, s'up Doc?". ~Plastic ring from a water bottle (the part that stays on the bottle when you screw the cap off). ~Half of a pipe cleaner in whatever spring-y colors you have. ~Plastic egg to put it in-optional. 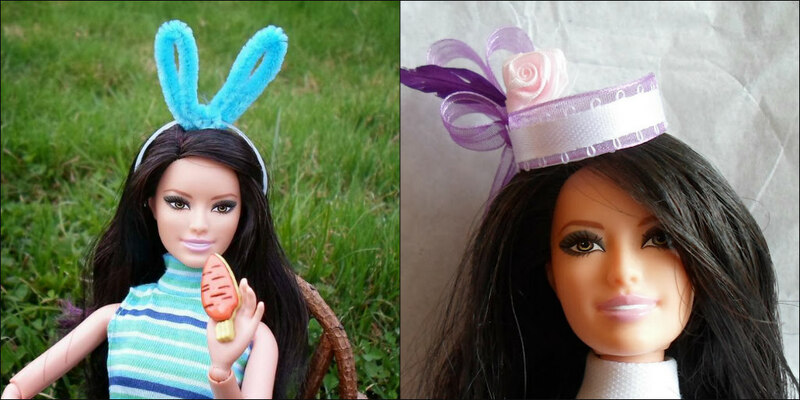 I also think it would be a fun surprise if the girl just finds her Barbie wearing bunny ears. Cut ring off of bottle. Bring the two sides of the pipe cleaner up around the ring (making a V), wrap each side tightly around the ring once. Fold each side down in half to make ears and shape them how you'd like. Reshape ring into a circle if necessary. Glue something pink or white to the middle if desired. ~Make something just for fun and have a happy day!